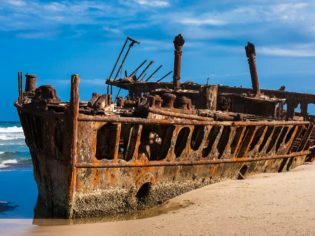 The SS Maheno: This former luxury cruise ship has been beached on Fraser's 75 Mile Beach since 1935. So you’ve made it all the way to the Australia’s great sandy island; tick these off your bucket list before you leave – we dare you. You really will get a lot more out of Fraser if you get your bearings first. There are several tour operators available, or you can do what we did – hire yourself one of the personable drivers from Kingfisher Bay Resort for a day ($1100 for four people with lunch). McKenzie is Fraser’s most popular spot for a reason – it’s beautiful! Though you can’t bring food down to the water’s edge (it attracts dingoes), it’s worth coming here with a book to lie on that powdery white sand for a while. Locals’ tip – the main beach is often busy with visitors, but a five-minute walk around to the next bay will take you to pretty Second Beach. Head left (if you’re facing the water’s edge) and look for the pathway. These natural rock pools on 75 Mile Beach (just north of Indian Head) get their name from the foaming water as it swishes in and out. Swimming on the beach in this area isn’t recommended thanks to the strong currents, but you can hop into this natural jacuzzi for a cool-down with no worries. We reckon walking through this paradise – complete with one of the clearest freshwater creeks you’ll ever see – would be just like walking through the set of Avatar. Look out for the island’s famous Satinay Trees (they’re signposted), which are so salt-water resistant that they were used to rebuild the London Docks after World War II. This pretty freshwater lake is slowly being swallowed up by the adjacent sand blow, and gets smaller every year. Swimming is not recommended as the lake is misleadingly shallow in parts, but the enormous sand dunes are well worth a visit (and a tumble down, if you’re feeling adventurous). 75 Mile Beach offers some fantastic beach fishing – not to mention the opportunity to watch the odd pod of whales breach in front of you. Make sure you observe size and bag limits, and only take what you need home. Air Fraser Island offers brilliant aerial tours of the island – well worth a look. Strong currents and the presence of sharks make 75 Mile Beach inadvisable for swimming, but Eli Creek flows from the bush onto 75 Mile Beach, making it a wonderful spot for a swim. Pack an Esky and join the many who come here to socialise as much as they come to swim. 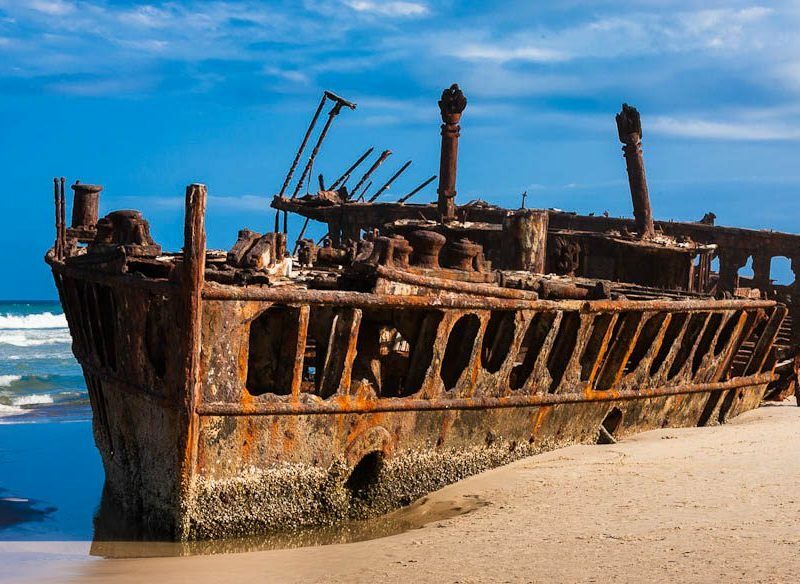 This shipwreck has been on 75 Mile Beach since 1935. Once a luxury cruise ship, it was on its way to its new owners in Japan when it was beached by a freak cyclone. The back end of the ship is missing, reportedly due to its role as a bombing practice target just before World War II.